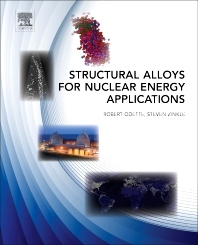 Structural Alloys for Nuclear Energy Applications instructs the current and next generations of researchers and industry staff on the behavior of steels and nickel-based alloys for nuclear energy applications. The book covers phenomenon, including fatigue, deformation and embrittlement, as well as materials topics, such as advanced ODS steels, RAFM steels for fusion, computational design of nuclear structural materials, and much more. Distilling valuable archival information for international researchers in the field of radiation effects on structural materials, this detailed reference is a critical resource for graduate students and institutional staff during a time of pivotal change in the nuclear industry. G. Robert Odette was most recently Professor of Materials and Professor of Mechanical Engineering UC Santa Barbara, Santa Barbara, CA, USA. Odette’s research focuses on building rigorous models for prediction of material performance in hostile environments, including intense neutron radiation fields in fission and future fusion reactors, as well as developing new high performance, long-lived structural alloys and composites. Research integrates advanced multi-scale models and experiments linking non-equilibrium microstructural evolution, fundamental micromechanics of deformation and fracture, performance sustaining mechanical properties, and structural integrity assessment. Odette has authored or co-authored 240 papers. He was winner of the ANS Distinguished achievement award (1994), and is a fellow of ANS (1998). He was past winner of the ANS Mishima Award (1998) & ANS Outstanding paper (2004). In February 2009 a TMS Symposium was held to celebrate his work on the occasion of his 65th birthday. Steven J. Zinkle is the Governor’s Chair Professor for Nuclear Materials, University of Tennessee-Knoxville and Oak Ridge National Laboratory in Tennessee. Zinkle has researched the physical metallurgy of structural materials; ion and neutron irradiation effects on the microstructure, physical and mechanical properties of metals and ceramics; fusion and fission reactor materials studies; deformation and fracture mechanisms. He is author or co-author of 230 papers. He was the inaugural recipient of the Robert Cahn Award, Elsevier Nuclear Materials Conference (2010), the IEEE Nuclear & Plasma Sciences Society Fusion Technology Award (2006), and was appointed ORNL Corporate Fellow (2004 – the “highest award possible to an ORNL staff member”), Fellow of TMS (2011), AAAS (2007), ANS (2007), ASM International (2003), American Ceramic Society (2001).